Take about 1 hour of your Saturday morning and get into quick and easy chicken meal prep. 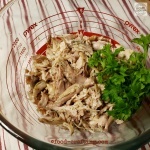 Using the Instant Pot® or the stove top, you can have 6 pounds of cooked chicken ready in 15 minutes. 6 lbs of bone-in skin on chicken. Two large chicken breasts and 4 large thighs. Set the Instant Pot® to the “Meat/Stew” setting. 15 minutes in the pressure cooker mode. No need to keep the meat on the Low setting. If you prefer, you can also prepare the meat on the stove top in a large Dutch oven. Simmer for at least 2 hours. Notes: Alternatives to the Lipton® recipe mix include Knorr® granulated bouillon and the Orrington Farms® seasonings.